A table shower, also called a Vichy shower, is a series of shower heads that attach to an extended metal bar. 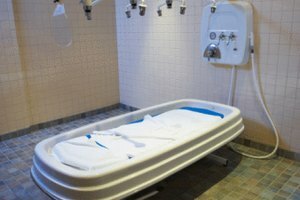 The bar is suspended above a waterproof massage table, and the shower is typically offered as a hydrotherapy component during a body treatment at a massage parlor or spa. The Vichy shower originated in the French city of the same name, where hydrotherapy is commonly practiced. Today, Vichy treatments are offered in spas around the world. In addition to the purported healing benefits of water, table showers are ideal for messy treatments like body scrubs or mud wraps, where the client is usually required to stop treatment and rinse off products. The table itself differs slightly from a regular massage table; drainage holes are added, and an optional splash guard is provided for the massage therapist's benefit. A detachable hand-held shower head may be included as well. Privacy is maintained by strategically-placed towels over the body instead of sheets, as in a regular massage. Disposable undergarments may be worn during a table shower treatment. The shower heads of some table showers are designed to align with the body's chakras (perceived energy centers along the spine), and are said to stimulate the clearing and detoxification of the body's aura or energy field.